This past summer the family and I took a trip to the eastern basin of Lake Ontario. This area is not known for its great architecture, but as an architect I look at everything and my head is always on a swivel. This often results in the car veering off the road, the need to slam on the brakes, or having to stop and take a picture. Even in this relatively rural area, I found structures to look at that I felt had architectural significance and in turn, got me thinking about architecture. There are a series of lighthouses scattered along the shore line of Lake Ontario. We visited the Tibbetts Point Lighthouse, in Cape Vincent New York, which is located at the junction of Lake Ontario and the St. Lawrence River. I instantly liked this structure. I was struck by the Romanesque quality and scale of this lighthouse. A relatively small structure that had a very powerful presence in the landscape. Even though the lighthouse was built in 1827, the simple materials used accentuate the form and create a modernist simplicity. 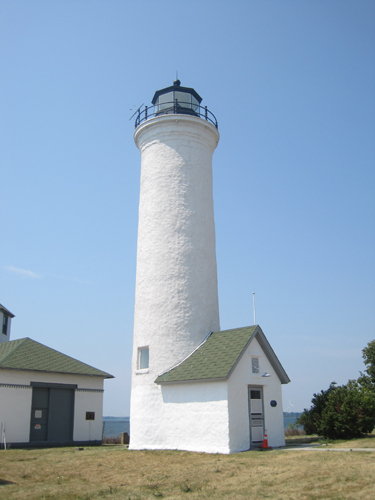 These characteristics give this lighthouse a timeless quality-a signature feature of great architecture. Looking Northeast from the Tibbetts Point Lighthouse is Wolfe Island Wind Farm, which is the second largest wind farm in Canada. I was really surprised to see the wind farm and I’m not sure why. The eastern shore of Lake Ontario is an extremely windy place. I know there is great debate over where wind farms should go and people often object to the noise the turbines produce and their visual impact on the landscape. 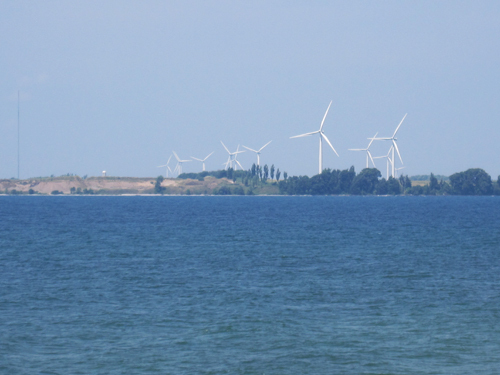 In the case of Wolfe Island, I thought the turbines actually added visual interest to what was a rather mundane landscape. 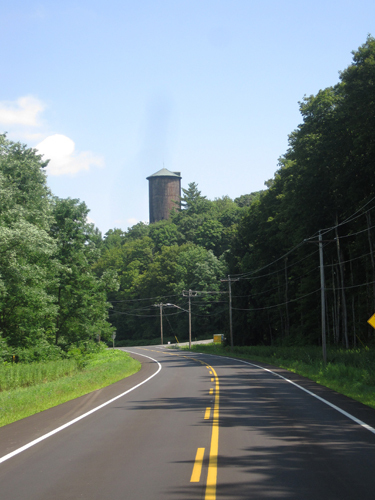 Driving down a back road in Oswego County I saw this silo and I just had to stop. I was struck. I didn’t know exactly what it was or what it was for, and I still don’t. It emerges from the trees and looks like it belonged. Some architects don’t pay much attention to the way their buildings relate to the landscape. They are more concerned about how their buildings look and work. I think that making a building look as it belongs in its place is essential. So I’m always looking for examples and I try to dissect why I think they are successful. This one I’m still thinking about. It’s really neat finding interesting structures off the beaten path. I saw so many very nice barns driving through Oswego and Jefferson Counties. I wish I could have stopped and photographed them all but, I don’t think my family would have tolerated that.